The night of February 25, 2015 was a celebration of innovation in the LED lights industry with the ceremony of the LEDs Magazine Sapphire Awards. Being named Illumineer of the Year continues an impressive symbol of both recognition and breakthroughs for Pilips Lumileds. In addition to this award, Pilips Lumileds recently won a world-famous LFI Innovation Award, introduced the world first hot color targeted LEDs, and announced the world first chip-scale packaged LED that can be directly surface mount reflowed onto a PCBA board. LUXEON CoB with CrispWhite Technology is another quality of light breakthrough in the Lumileds scope of products. 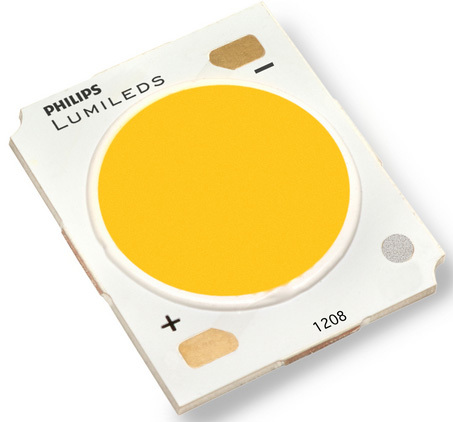 Philips Lumileds LUXEON CoB is awarded Illumineer of the Year at LEDs Magazine Sapphire Awards. "This is extraordinary proof of the tremendous work we have been doing here at Pilips Lumileds. I could not be more proud of our whole team. 2014 was a historically good year for Pilips Lumileds – and with all the exciting changes, improvements and innovations planned for 2015, I am pleased to say, we are just getting started!" Pierre-Yves Lesaicherre, CEO, Philips Lumileds. CrispWhite is a great example of how LED technology will take the lighting industry to new heights, delivering a feature set in LED lights products that the industry could never achieve with incandescent, halogen, or ceramic-metal-halide (CMH) sources. The Illumineer of the Year crown went to the team of Eric Senders, Bob Zona, Rene Helbing, Mushfeque Manzur, and Catherine Othick from Philips Lumileds for their work on LUXEON CoB (Chip-on-Board) LED with CrispWhite Technology. "CrispWhite really delivers the light quality that retailers have been looking for some time," said Eric Senders, Product Line Director, Philips Lumileds.